The Rock-A-Feller Vintage Nicaragua Maduro is a line produced by Vintage Rockefeller Cigar Group. This company has been around for several years ands connections to the famed Rockefeller family. Earlier this year, Vintage Rockefeller Cigar Group was acquired by Kevin Schweitzer, a Wall Street trader who has been a cigar enthusiast for 25 years. Schweitzer became the company’s sole owner and President and set his sights on taking the company to the next level. Vintage Rockefeller Cigar Group produces cigars in both the Dominican Republic and Nicaragua. This year, Schweitzer is expanding his company’s footprint, and as a part of this effort, the Vintage Nicaragua line has been put into widespread release. Recently, I’ve smoked the Vintage Nicaragua Maduro in the Churchill size. Overall, I found this to be both an impressive maduro and an excellent Churchill offering. The Vintage Nicaraguan line originally was a private line offered by Rock-A-Feller Cigars. Shortly after acquiring Vintage Rockefeller Cigar Group, Schweitzer discovered the blend and felt he had something special. He commented on this project shortly after acquiring the company. The Vintage Nicaraguan Maduro line is a three-country multi-national blend highlighted by a Mexican San Andres wrapper. The Vintage Nicaragua Maduro line is available in six sizes – each packaged in 20-count boxes. The Rock-A-Feller Vintage Nicaraguan Maduro Churchill had a classic chocolate brown color maduro wrapper. There was a light coating of oil on the surface of the wrapper. While there were some thin visible veins and thin visible wrapper seams, the wrapper was skewed toward the smoother side. 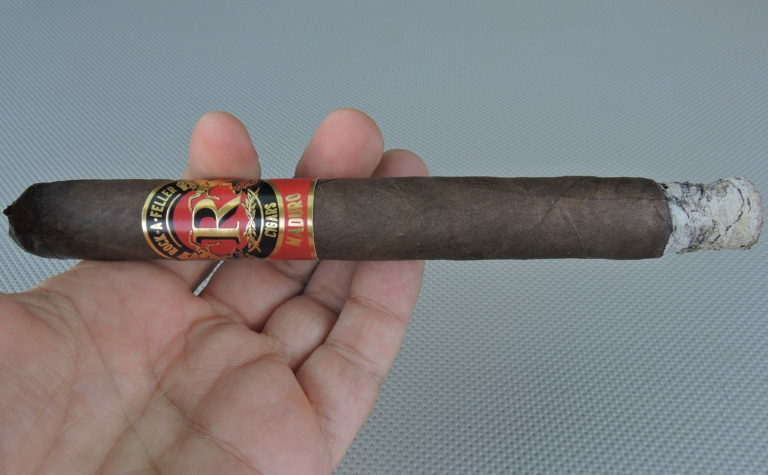 The band of the Rock-A-Feller Vintage Nicaraguan Maduro has a red, black, and gold color scheme. At the center of the band is a gold-colored “R” with black shadows sitting on a red circular background. Surrounding that background is a black colored ring with a gold Pegasus on each side The upper part of the ring has the text “ROCK-A-FELLER” in gold on it, while the lower part has the text “CIGARS” in gold. The upper left and right of the band has a black background with various gold adornments on it. The text “2010” is on the far right. The lower part of the band is red, creating a pseudo secondary band effect. On that area is the text “MADURO” in gold font. Prior to lighting up the Rock-A-Feller Vintage Nicaraguan Maduro Churchill, I used a straight cut to remove the cap. There was quite a bit going on with the cold draw, as I detected notes of leather, wood, earth, and chocolate. Overall I found this to be an excellent pre-light draw. At this point, I was ready to light up Rock-A-Feller Vintage Nicaraguan Maduro Churchill and see what the smoking experience would have in store. The start of the cigar delivered notes of leather, earth, cedar, and a slight citrus note. The leather and cedar primary notes became primary early on. The citrus and cedar became secondary notes. These background notes were quickly joined by notes of earth and a slight mixed pepper note. The retro-hale delivered notes of cedar, red, and black pepper. This retro-hale delivered a gentle and not overpowering layer of spice. Later in the first third, some dark chocolate entered the background. The earth and chocolate combination increased. By the second third, this combination became the primary flavor. There was also a creamy undertone present during this stage of the smoking experience. The cedar became a slight secondary note and the leather notes dissipated. Meanwhile, I still detected notes of pepper and citrus in the background. The last third of the Rock-A-Feller Vintage Nicaraguan Maduro Churchill saw the cedar re-emerge and displace the chocolate and earth in the background. I also still detected some notes of pepper and citrus. This is the way the cigar experience came to a close. The resulting nub was firm to the touch and cool in temperature. When it came to the burn, I found the Rock-A-Feller Vintage Nicaraguan Maduro Churchill scored nicely. It had no problems maintaining a straight burn path. This cigar also maintained a relatively straight burn line. The resulting ash was light gray was some darker spots mixed in. While it wasn’t the firmest ash, this wasn’t a loose, flaky ash either. As for the burn rate and burn temperature, both were ideal. I also found the draw to the Rock-A-Feller Vintage Nicaraguan Maduro Churchill to be equally impressive. This cigar had a slight bit of resistance to it – which is something that I like. This made it an enjoyable cigar to puff on. In terms of strength and body of the Vintage Nicaraguan Maduro Churchill, I found both attributes to have a sweet spot in terms of how it meshed with the flavor profile. The strength started out medium. Toward the last third, there was a slight uptick and it provided just enough boost to push this into medium to full territory. The body followed a similar path – starting out medium to full-bodied, and with a slight kick at the end that put this cigar into all full territory. In terms of strength versus body, I gave the edge to the body throughout the smoking experience. Before Schweitzer acquired Vintage Rockefeller Cigar Group, I had smoked some of the Dominican blends and had enjoyed them. I was quite happy to see Schweitzer take over the company as I thought the brand needed a boost. The expanded distribution of the Vintage Nicaraguan cigars was a nice added bonus. The Vintage Nicaraguan Maduro Churchill delivers an enjoyable flavor profile that can keep both classic and contemporary cigar enthusiasts happy. This is a cigar I would recommend to an experienced cigar enthusiast, but it’s one I would not discourage a novice from trying.